President Obama should have thrown the banksters in jail. That’s more or less what former Federal Reserve chairman Ben Bernanke said in an interview this weekend with USA Today. Bernanke doesn’t get off totally scot-free here. If he really felt that way back in 2009, he could have said so publicly. Yes, the Fed “isn’t a law enforcement agency,” but its word still carries a lot of weight in Washington and around the world. If Bernanke, as the Fed chair, had said that it was a good idea to prosecute bank executives, that would have put a ton of pressure on the Justice Department to do so. 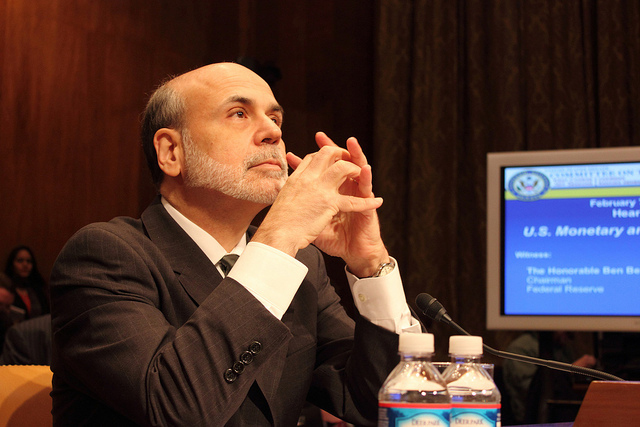 But anyways, all questions of personal responsibility aside, Bernanke is right. We SHOULD have criminally punished more banksters after the financial crisis, and the fact that we didn’t – and still haven’t – will go down in history as one of this administration’s biggest screw-ups. That’s because the only thing that actually keeps big financial institutions in check is prosecutions. Just ask Ronald Reagan and George H.W. Bush. In the wake of the savings and loans debacle of the 1980s, the Reagan and Bush administrations prosecuted more than 1,000 different individuals for their role in the crisis, and of those prosecutions, 839 resulted in convictions. The Reagan and Bush administrations also stripped the savings and loans associations of their assets, nationalized them and then resold them to the public using a special agency called the Resolution Trust Corporation. Not coincidentally, savings and loans associations have been remarkably stable ever since. President Obama should have done what Reagan did. He should have criminally prosecuted the Wall Street banksters. Back when he was a deputy attorney general in the Clinton administration, Holder wrote an infamous memo in which he laid out a plan for how to deal with large financial crimes. Nicknamed the “Holder Doctrine,” his plan was simple: Instead of prosecuting big banks and thus “destabilizing” the financial system, the government should just hit them with financial penalties – just fine them. Ten years later, Holder got a chance to put his doctrine into practice when he became Attorney General, and he followed it to a tee. During his tenure as the nation’s top law enforcement officer, no major Wall Street player in the great mortgage bubble of the 2000’s went to jail for their crimes. Holder’s Justice Department did slap a few big banks like JP Morgan with multi-million dollar settlement fines, but those fines are chump change compared to the billions those banks take in every year in profits, including the profits from illegal activity. These fines have just become a routine cost of doing business for the banksters. They’re also tax-deductible, which makes the idea that they could ever serve as a deterrent to future bad behavior just flat-out ridiculous. Thanks to the Holder Doctrine, the big banks are bigger than ever and comfortable in the knowledge that they’re still too big to jail, six years after they got caught robbing the US blind. That needs to change, and it needs to change now. Eric Holder is now out as Attorney General, and his successor, Lorretta Lynch has promised to hold the banks to a tougher standard. Let’s hope that standard means prosecuting high-up executives and CEO’s, because if it doesn’t, the odds of another crash are rapidly approaching 100 percent. We cannot worship the almighty dollar if we want to make a more prosperous society for everyone. McCarthy has no business being two heartbeats away from the White House. When people can’t vote, the oligarchs win.